Before Hollywood and before royalty, Grace Kelly grew up in a charming house in Philadelphia. 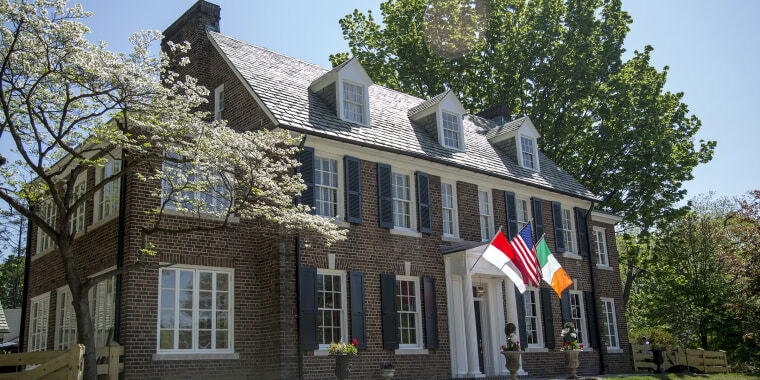 Before Grace Kelly was an Academy Award-winning actress and a princess of Monaco, she spent her childhood in Philadelphia, living with her family in a charming two and half-story colonial home. Located in the city’s East Falls section, the six-bedroom house was originally built in 1928 by her father John B. Kelly, a three-time Olympic gold medalist in rowing. While the home has switched owners through the years, it’s now back in the family after the princess’s son Prince Albert of Monaco purchased it in the fall of 2016 for $755,000. "I think after talking to some of my cousins about this, we didn't want to see it disappear or see it transformed in any way by future owners," Prince Albert told Hoda Kotb on TODAY. "It's a big part of our family's history." Today, the house has been restored to resemble the period when the Kellys lived there. Use your mouse or fingers (on mobile) to guide your way through the space. Pro tip: Use your VR set or cardboard VR headset for a fully immersive experience. Prince Albert and his cousins went through old photographs and videos of the home to get it as closely as they could to its original state, said Toby E. Boshak, Executive Director of the Princess Grace Foundation-USA. Historic gems personal to the Kellys are also found throughout. In the second floor linen closet door, you’ll find all of the etchings of the children’s heights from two years old to their late teens, clearly marked on the door. As to why the past owners probably didn't paint over them, Prince Albert told TODAY that he thought they realized it was part of the family's history. "Maybe they thought we were going to take it back one day," he said with a laugh. The second floor also holds four of the bedrooms, one of which belonged to the young Grace. "I've seen family movies of her as a kid so I can see her running around," he said. In the basement, there’s a den where the family used to have Christmas Eve parties. It's also where they did the interview after Grace Kelly and Prince Rainier's engagement announcement. Adjacent to the room is a real bar which the family called “Kelly Tavern.” An oar that is believed to have belonged to Mr. Kelly hangs above the bar, and the point of his scull is displayed as well. Boshak said the home will be used by Prince Albert and his family any time they visit Philadelphia. The home will not only be a place for the family to stay, but will be used as the offices for the Prince Albert II of Monaco Foundation which supports environmental issues. It will also be a place to hold events for The Princess Grace Foundation-USA, which provides scholarships and career assistance to emerging talent in theater, dance, and film — three areas of the arts the princess was passionate about.